Full article provided below and also on the Rorati Caeli website here. Another article here. 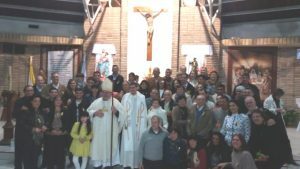 “This past Sunday at the Parish Church of San Roque, Reconquista, Santa Fe (Argentina), the local bishop, Msgr. 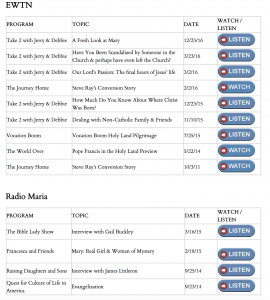 Macín, appointed by Pope Francis in 2013, carried out a monumental and sacrilegious scandal that clearly shows what’s behind Amoris laetitia. 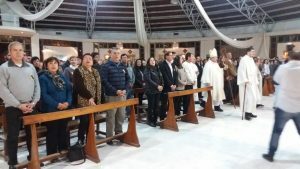 “In the same way, communion was given to all those mentioned (some 30 couples) accompanied by their relatives who took photos in a festive atmosphere. At no point was reference ever made to the Scriptures which condemn adultery, and again and again the excerpts of Amoris laetitia are mentioned where it is said that the divorced and remarried ought to be included in full communion. “This bishop, and all those who follow this type of directives and actions, are simply apostates, wolves dressed in sheep’s clothing, who not only send souls to hell, but also profane the Eucharist, for which they will have to give an account before God.